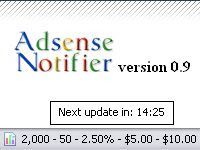 "Add-ons" and select the Adsense notifier plugin and select options. You need to enter your Google Ad Sense ID and password to login. You can also set time between each updates. You can download it here. If you are not use Firefox, you can do another way. SysSense is a personal desktop Google Ad Sense monitor. It stay in the Windows system tray. You can monitor an unlimited number of Google Ad Sense accounts. You can download it here. 你在blog上安放Google Ad Sense吗？你想不用登陆它的网站就能查看你的账户情况吗？如果你是用的是Firefox浏览器的话就可以用一个简单的方法实现。Adsense Notifier是一个Firefox插件，它能在Firefox工具条上显示你账户的情况。当你安装好Adsense Notifier后，可以到"Tools"、"Add-ons"和选“Adsense notifier plugin“，再选“options“。输入你的账户的用户名和密码，你可以设定检查的时间。你可以直接在这里下载. 如果你不用Firefox的话，也可以用另一个小软件。SysSense是一个个人Google Ad Sense桌面监视器，它可以驻在系统托盘上，你可以使用它来监视无限制的Google Ad Sense账户信息。你可以直接在这里下载.